As a homeowner you juggle a lot of responsibilities. Between financial responsibilities and general upkeep it can be easy to forget about a very important part of your home. Your electrical system or even your electrical panel. In today’s post we’re going to shed some light on the function of electrical panels. And why you should consider replacing it. 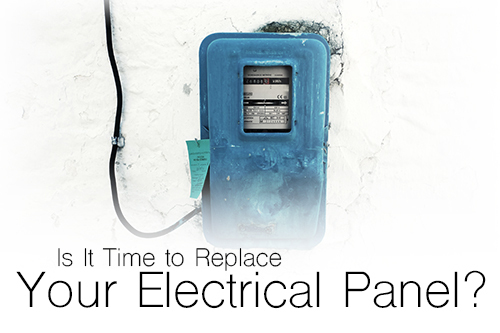 If you’ve found yourself wondering, “Is it time to replace your electrical panel?” then this is the post for you! Let’s begin by look at the function of the electrical panel in your home. The function of an electrical panel is really quite simple. It acts as a point of entry connecting the power lines and/or sources outside your home to your homes electrical system. Just like any piece of equipment your electrical panel will age and wear over time. So, how do you know it’s time to replace it? The answer is when you begin to notice lights flickering. Random decreases in power and appliances that don’t function properly are a few indicators. Another sign that you need to replace your electrical panel is in the panel itself. If it is over 20 years old or if something in the panel is giving off a burning or odd smell it is a sign to replace it. Another thing to check on the panel is its temperature. And no, we don’t mean finding a thermometer and telling it to say, “Ah”. Place your hand on the panel and if it feels warm it can be a sign that the panel is overheating. If your electrical panel is over 20 years old or is showing signs of wear the answer is yes. Old, overloaded and worn out panels can create a serious fire hazard. Not to mention if they go out suddenly you can be left without power. If you’re considering replacing your electrical panel call the professionals at Electric Doctor – they will be able to assess your panel and help you find a solution to keep your home safe and up to date.